It can be so confusing reading different manufacturers claims as to why their product is the best, but let’s look at some basic absorption facts. Should you go with EDTA Oral Chelation Liquid or Chelation Pills ? There have been many studies, and the resounding answer is that the advantages of liquid oral chelation therapy outweigh a pill or capsule based chelation therapy. One of the most referred to recommendations and statements is that found in the Physician’s Desk Reference, page 1542. In this widely used reference book, it is noted that only 5 -18% of nutrients that are taken in pill form actually end up in the human body’s cells. This means that 80-95% of the nutrients are passed or excreted from the body when taking pills. Translate this into monetary terms and for every €100 spent on pills, approximately €90 ends up down the pan! 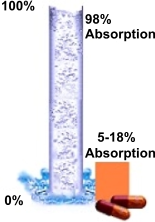 In contrast, liquid forms of the same supplement, in this case liquid chelation, has an absorption rate of up to 98%. So here is a sum up of the benefits of a Chelation Liquid.